Most of the shops are open Monday to Saturday from 10:00 till 19:00 o'clock and Sunday from 12:00 till 18:00 o'clock. 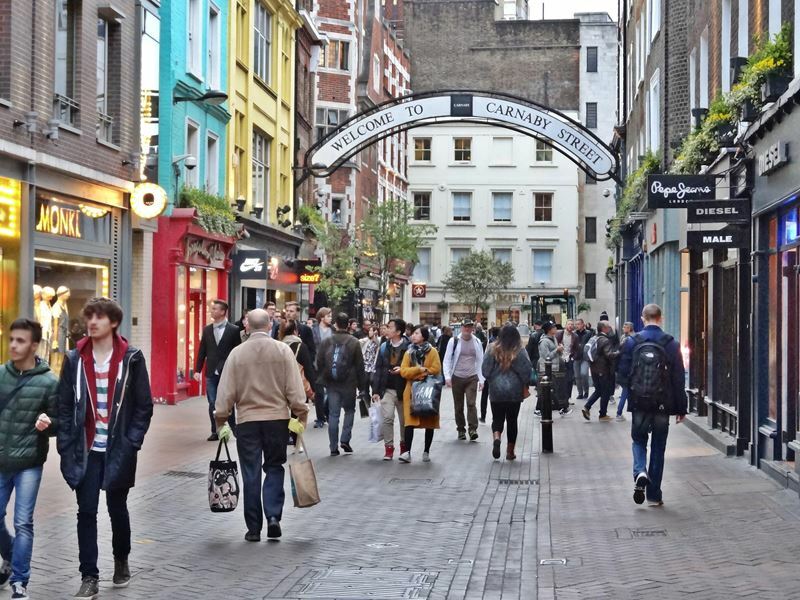 Tip: The Carnaby Street offers numerous possibilities if you like to make some breaks during your shopping tour through London. There are not only fancy stores in the shopping street, but also some inviting pubs, bars and cafes. 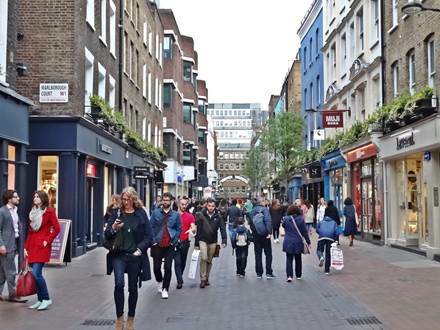 Carnaby Street is located in the corner between the two shopping streets Oxford Street and Regent Street. 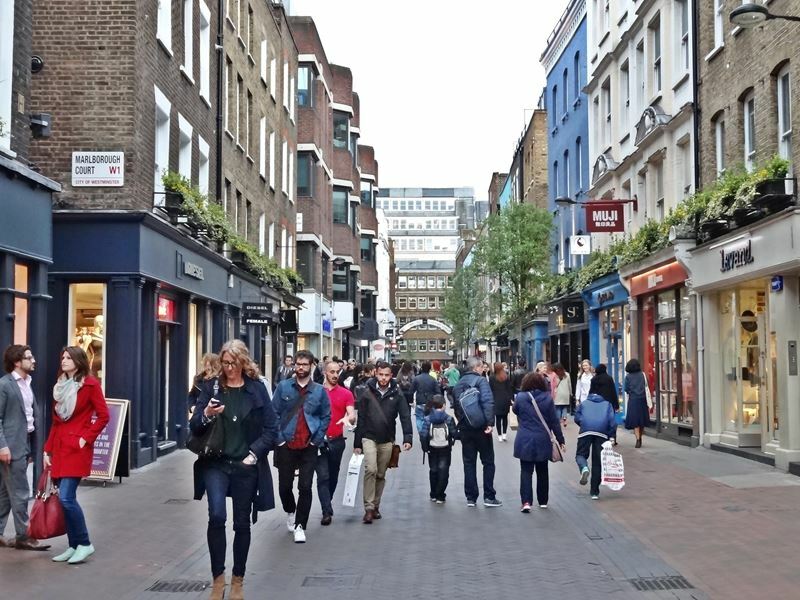 In contrast to the high-traffic in Oxford and Regent Street the Carnaby Street is a pedestrian zone and therefore more pleasant for a shopping spree. The street is only about 200 m long and thereby easy manageable. However, due to the many small side alleys you will still find several shopping possibilities. The Liberty department store at the corner of Carnaby Street and Great Marlborough Street is a large luxury shopping mecca in an impressive half-timbered building and is the exception to the rule. This department store, founded in the year 1875, is a contrast to the small and modern shops in the Carnaby Street. There are branches of famous fashion brands such as Levi's, Puma, Pepe Jeans, Diesel, Replay ... But also offbeat shops such as Irregular Choice (no. 36), where exceptional shoe fashion is offered, or a branch of the fashion chain Monki (no. 37), which belongs to H&M and where you get young and stylish women's fashion. Besides the shops, there are a large number of pubs and cafes around Carnaby Street. 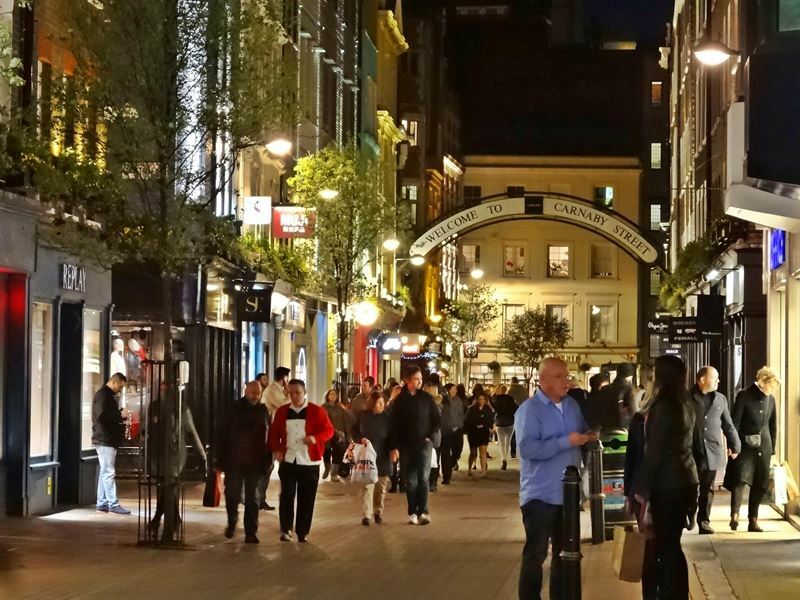 Especially in Kingly Court, which is a courtyard, you will find many restaurants, cafes and bars. You reach the Kingly Court by a narrow passage from Carnaby Street. The entrance is directly opposite the Broadwick Street. If you have only appetite for a little something to take along, then you should have a look at Crumbs & Doilies in Kingly Court. The delicious homemade cupcakes are perfect for an exclusive snack in between. Right at the beginning of the Carnaby Street at the corner of Foubert's place is one of the oldest and most famous pub in this area. The Shakespeare's Head was opened in the year 1735 and belonged at that time to some distant relatives of William Shakespeare. A pub with typical atmosphere but unfortunately most of the time quite crowded. 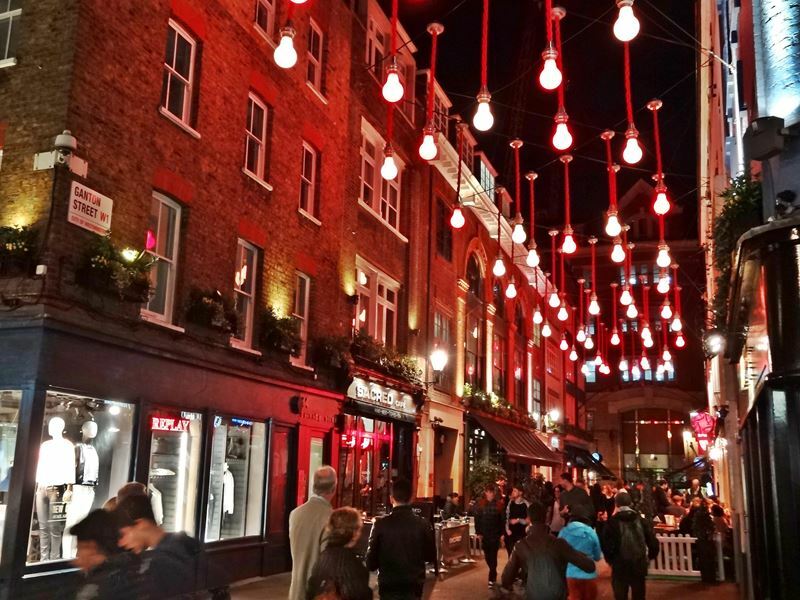 If you are looking for some alternative just go a few steps further to the Ganton Street or the Kingly Street. There are some more pubs and cafes. The first shops which offered fashion in the style of the mod and the hippie movement opened in the early 60s. But it did not stop with the fashion, some music clubs and bars opened in the area around Carnaby Street. 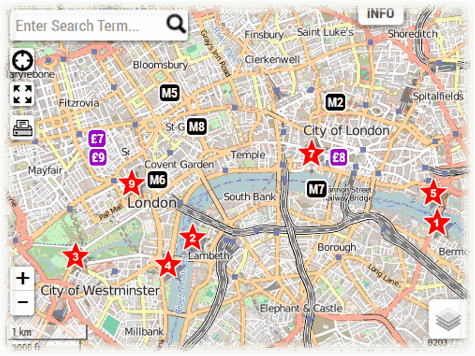 Famous Rock Stars like the -Rolling Stones- and the -The Who- performed in those locations. In the late 60s the Carnaby Street did belong to the most visited attractions in London. Today there is not much left to see from those times. Only a few shops of this period have survived. Among those is Sherry's in Broadwick Street no. 63, a small shop with mod fashion. The shop for the mod fashion label Lambretta is located directly at Carnaby Street no. 29.